It is said that nothing travels faster than light, but this is untrue; the speed of business is slightly faster than the speed of light. 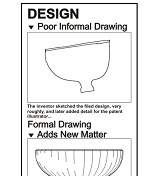 In the light-speed rush to bring a new product to the market, inventors often wish to file what are called “informal” drawings as part of their patent application, i.e. drawings that may be hand sketches, or low quality images of, say, micrographs if the patent relates to life sciences. 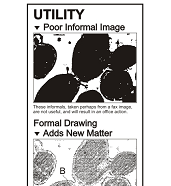 “Informals” are drawings which communicate important elements of the invention but do not meet the requirements needed for a drawing to pass examination. Note: The USPTO no longer uses the terms “informal” or “formal” in their work. Rather they distinguish between drawings that are simply “acceptable” or “unacceptable” in examination. The old terms remain, however, in common usage outside the USPTO. Applicants file informals because they wish to avoid the cost of preparing formal drawings early in the product development process, and because formal drawings may take as long as a week or even two (for a large application) to prepare. It is common for this to pose a serious problem in replying to an office action. Consider the fictitious example illustrated here. The poor quality informal figure of a life sciences micrograph (taken from a low quality scan perhaps?) teaches little useful information. Later, as the drawings are formalized, a better copy of the micrograph suddenly becomes available, but an exacting examiner may reject it because it reveals cellular structure not seen in the informal. The applicant may reach an impasse in dealing with a picky examiner. Perhaps a long drawn out negotiation, several long phone calls, and numerous emails will resolve the issue and bring the examiner around. Perhaps not. Let’s look at another fictitious matter to illustrate what can happen in filing informals, a design matter in this case. The inventor has provided rough sketches, and they are filed. Later, in an effort to match the drawings to the actual product (based on suddenly available photos of a prototype) new drawings are prepared. An exacting examiner wastes no time in rejecting the formal figures as they introduce considerable new matter. Again, perhaps the examiner will be amenable to still later changes, perhaps not.